Love those awesome fizzing bath bombs but don’t want to spend $6 a piece? 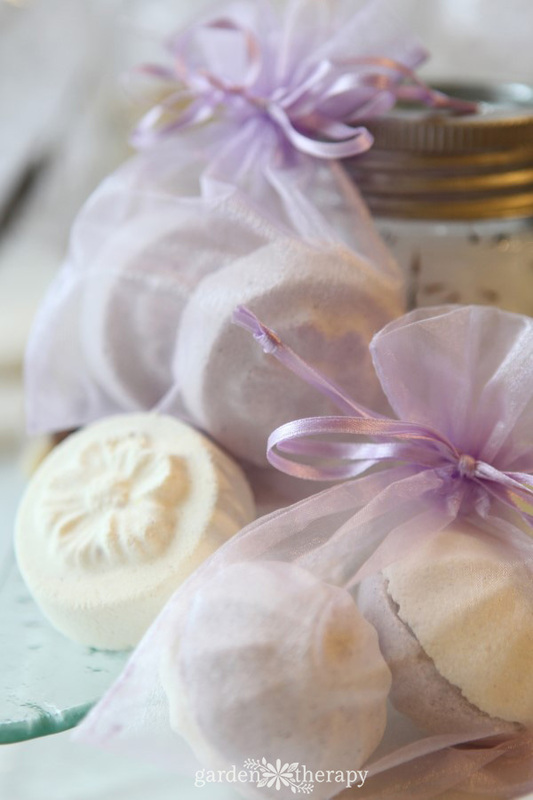 It’s easy to make your own DIY bath bombs with natural ingredients that soften your skin. Rather than large round bombs, these are half the size. It is just enough for one bath which makes them go a lot further. 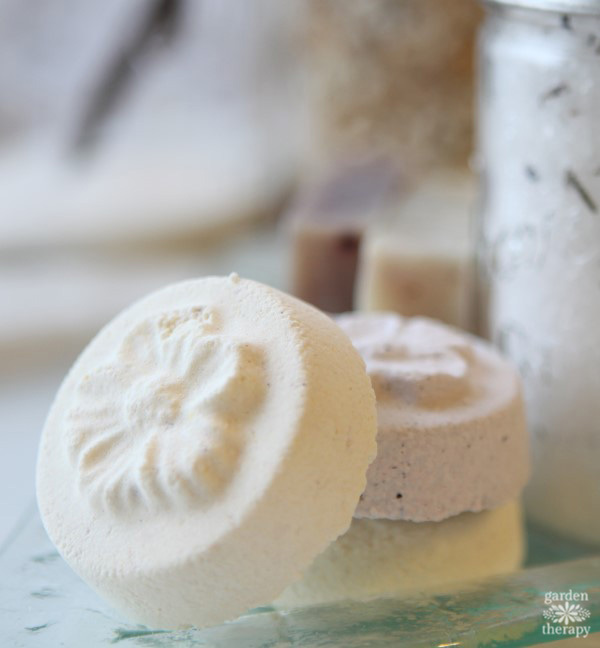 Using floral or decorative molds makes these look pretty and a breeze to make without the fuss and headaches of trying to get the round bath bomb to stick together. Don’t get me wrong here, I love a round bath bomb and have made many in my days crafting up skin care and beauty products. The technique does take a bit of practice to master, and there are times when you just want to make a bunch of them to give away as gifts and know FOR SURE that they will not crack or explode and look pretty enough to give away. When you press one into a floral-, heart-, or shell-shaped mold, they will almost certainly turn out beautifully making this a great project for beginners and kids. That being said, if you WANT to make a round bath bomb, then you can certainly use this recipe and there are instructions down at the end of the post. 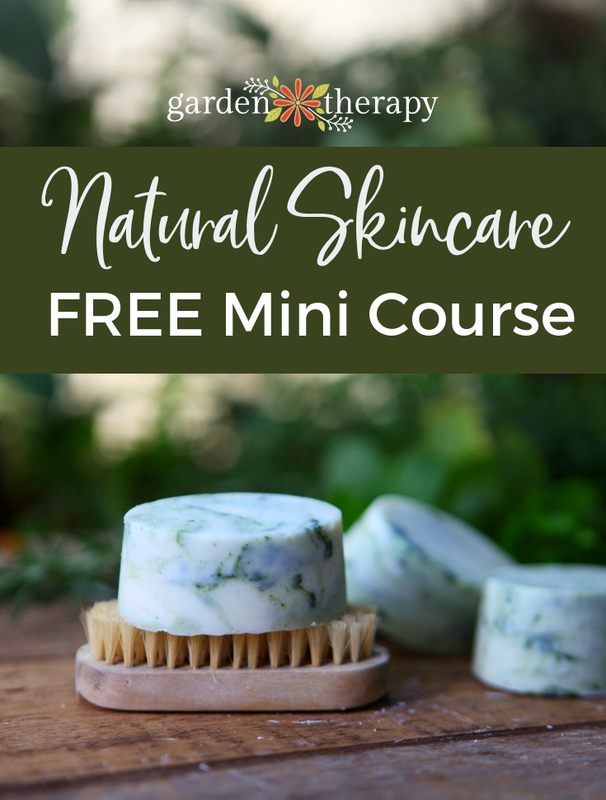 As this recipe is part of the Natural Skincare Series, you can feel good that the ingredients are natural and safe for your skin and for the water. I see so many projects (unicorn rainbow, anyone!?) that are loaded with artificial dyes and colorants that are just not needed. Plants and nature have provided us with so many wonderful scents in the form of real essential oils and just as many natural colour options. There is a better way! I know there are a lot of other recipes that recommend using synthetic fragrance and colouring out there and I know that they make bright and beautiful bath bombs. I don’t want to say that they are toxic, but I choose to use natural ingredients for myself. You can certainly look up the ingredients that you plan to use for your DIY skin care projects and prepared packaged products on the SkinDeep database. I will say that I choose to use natural fragrance and colour because they can offer helpful properties to the bath bombs, like aromatherapy. The soothing fragrance of lavender is the perfect compliment to a relaxing bath. Just a few drops in your bath bomb will add a subtle fragrance that can help to soothe stress and restlessness. You can also add lavender buds, rose petals, or other flowers right onto the bath bomb like I did on the cover of my Home Apothecary book! And as for colouring, there are many options available that are 100% natural and will not harm you when absorbed into your skin. Try powders like turmeric for a golden yellow, ratanjot for a lovely purple, blueberry for a blue/purple, spirulina for a blue/green, and madder root powder for pink. Check out this post on Easter Egg Bath Bombs to see how these natural colours turned out. 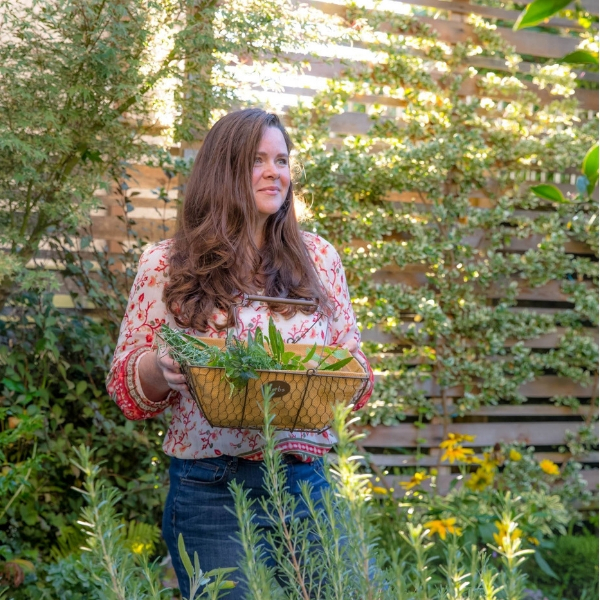 You can feel confident that when you use these natural products or give them as gifts, that they are healthy for the body. 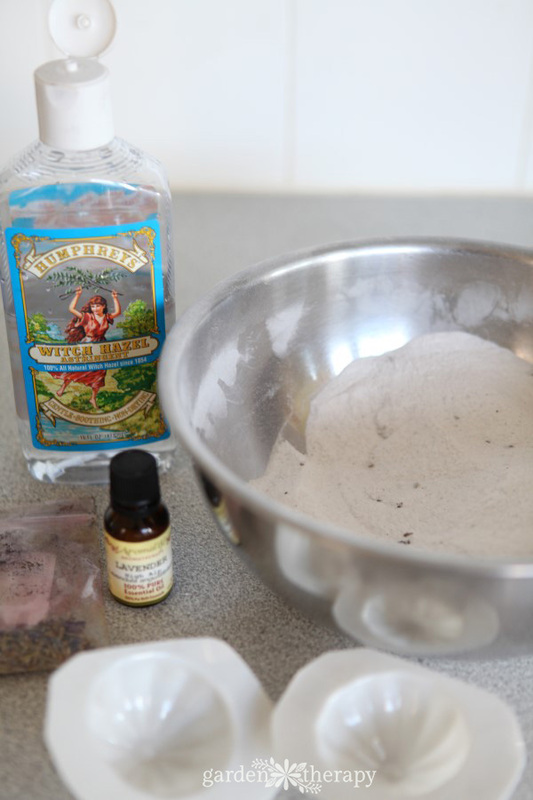 Making your own DIY bath bombs is a great way to know exactly what is going into the water and on to your skin (or the skin of those who you love!). 1. In a large bowl, measure in the baking soda and citric acid and mix well. 2. Add a 1/2 teaspoon of coloring and mix well. Add more coloring if you want a deeper color, but keep in mind that too much coloring will leave a ring in your tub, so go easy. The color will become more pronounced when you add the witch hazel anyhow. 3. Add 20-30 drops of essential oils and mix well. 4. Using an atomizer or spray bottle filled with which hazel, spray the entire surface of the powder mix and mix with your hands. Keep spraying and mixing rapidly until the mixture holds together when scrunched with your hand (think of making snowballs). 5. Working quickly, firmly press mixture into molds. You can use soap-making molds, chocolate molds, ice cube trays, or even plastic Christmas tree ornaments that snap into two parts. The key is that they are plastic and large enough for the bath bomb to combine and set. 6. Gently tap the mold so that the bath bomb releases and carefully lay on a towel or tray to dry. 7. 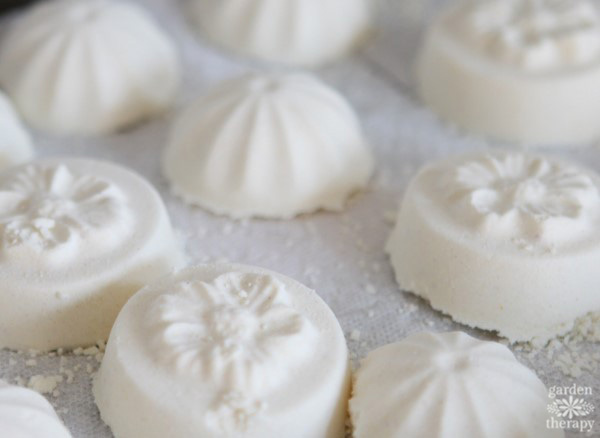 Let the bath bombs dry for 30 minutes or until they are firm and won’t fall apart. 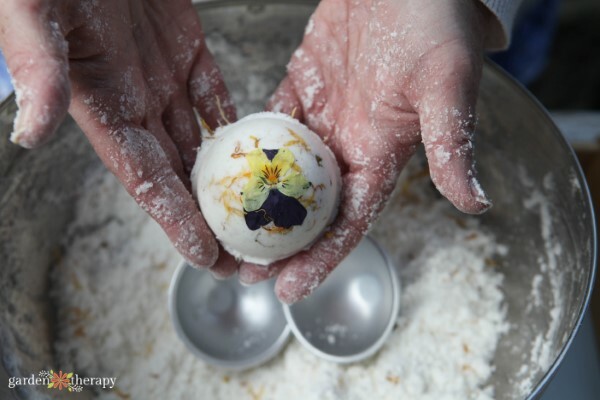 To make a round bath bomb, over-fill two round halves and press them together firmly before tapping the molds to release the bath bomb. Or you could simply package them up in pairs in an organza bag. 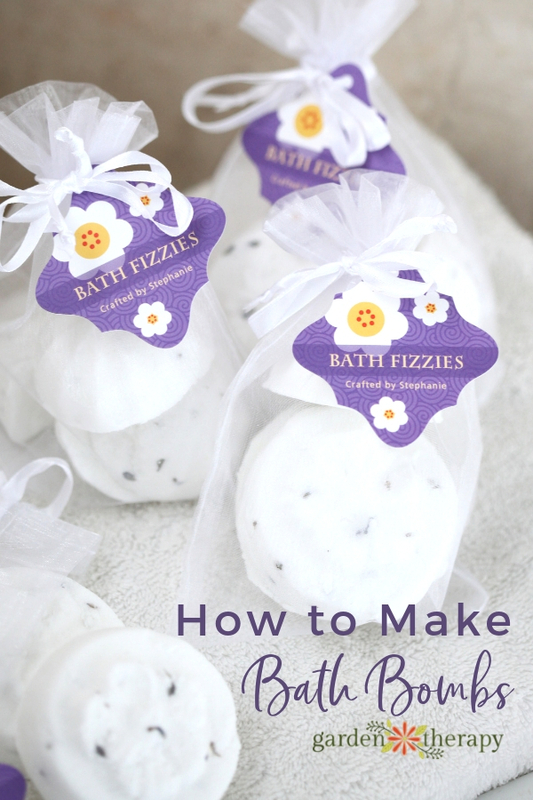 More Posts on Bath Bombs and DIY Natural Skin Care You Will Love! Thank’s for this. I appreciate your time & effort for this Keep it up. I am looking for a way to make bath bombs completely natural as well as having health benefits. When I was reading up on turmeric I read that it can dye the skin yellow. Have you had any problems with this? Hi Joni, no, it has never been a problem. Turmeric can dye skin if you use a lot, but for this recipe, you use just a tiny bit to give it color. It doesn’t even dye my skin when forming the bath bombs. It is one of my favorite natural colorants to use. I just made soap with it three days ago too! Where did you get the pretty flower molds?